It had been a while since I last drove a Mercedes and it showed as I looked around the controls. I had deduced that it was an automatic but didn’t immediately see the gearshift that is integrated in the right-hand stalk. An interested combination then of an automatic diesel within a cabriolet. 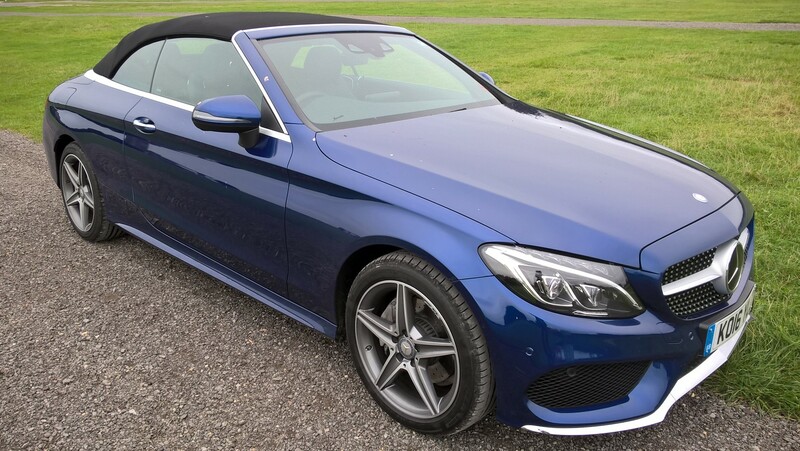 Tasteful it is and of course, I had to sample it in cabriolet form around a damp York racecourse and am glad that I had the roof retracted as out on the road, parents gathered outside a primary school as the cherubs escaped – it still gained admiring glances, nevertheless. 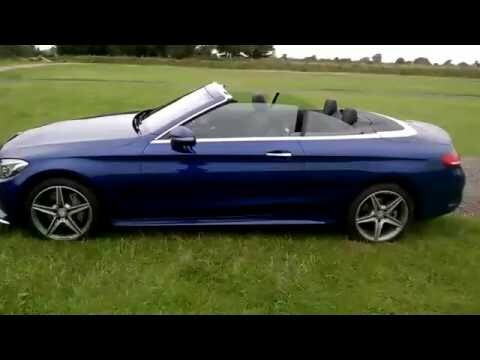 Mercedes call it an “acoustic soft-top” which is ironic – it can also be opened and closed whilst driving up to 30 mph. The downsides to matching a diesel to a softtop is that firstly, there will be increased noise intrusion that was apparent and secondly, vibration was felt through the throttle pedal and through the driver’s floorpan on kick-down or pedal to metal. I’m assuming this isn’t down to a lack of rigidity but simply due to the 2143cc twin-turbo diesel engine. Watching the revolution meter needle flicker as the nine speed automatic transmission did its thing whilst the optional AIRMATIC air suspension system adapted to the driving conditions i.e speed bumps and undulating A-roads for further comfort. Optional permanent all-wheel drive 4MATIC system also gave assurance. On the road, it will cost you £43,205 although options on our test vehicle amounted to £50,060 including a cheeky £645 for ‘Brilliant blue’ metallic paint. A refined drive, then? 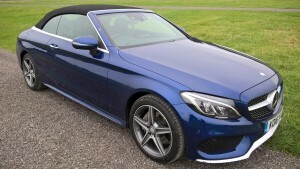 It would be in anything but a cabriolet then again a petrol C200 automatic without 4MATIC will save you four thousand pounds and I am sure it would be quieter – in an acoustic soft-top.